Returning visitors are crucial for the growth and development of blogs and websites. Visitors, visiting your blog again and again, adds value to your blog and help you in ranking your blog better in search engine result pages. Good experiences of visitors with your blog make them visit again and again, another side if they feel bad experiences then they will never come again on your blog. Visitors with bad experiences also don't stay long on your blog to read, which becomes the reason on increasing bounce rate, which again harms your blog. 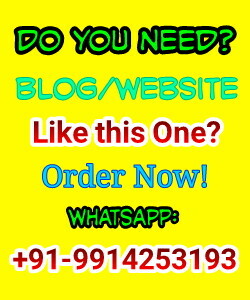 Sometimes, you have been getting good traffic on your posts but still bounce rate is very high, because you may have gotten rank for some posts or keywords in search engines but content quality is very low so visitors are coming from search engines, but they don't like to read the post fully and leave blog within few seconds. Also, I would like to mention here, it's very hard to rank a post with low quality content but sometimes it happens. We also see, some spammers or persons who are copying articles from others are ranked well and better than the original writer. These type of things become the reason of bad experience and increasing bounce rate. So we have to avoid these type of things and make our blog readers regular blog reader. Converting blog readers into the regular reader is imperative, if we want to improve bounce rates and users experiences. Pop Up Ads make readers annoying, in simple users hate Pop-Up ads. Even I also never visit again the fellow blogger sites who are using pop up. Some Ad networks provide offensive pop up ads which may create problems for readers. So if you don't want to loose your loyal readers, go ahead and remove all pop up ads from sites. If you want to earn income then go for Adsense, Chitika, ebook selling or affiliate marketing. Sometimes, we face these type of conditions on blogs asking to do something to read the full article. They offer to share the post, fill a survey and so on, before reading the whole article. In that case reader only quit that page and start avoiding visit pages related to that particular domain. We all know there are lots of articles on the same issue on the internet, user leave the blogs who have 'to do conditions' and go for some other results of the same problem. Just remove these type of conditions or your blog will be harmed. Interlinking posts is a good idea. We can check the excellent examples from Wikipedia posts. But using excessive hyperlinks and interlinking sometimes confuse readers mind for what to read first and what to after. They aren't able to prioritize the importance of links and usually they have been diverted from the real topic. Later, when readers realize, they decide to read the same solution from some other blog. If they are satisfied from other blogs, then they won't visit your blog again. So, use the links but in a limit. Mostly readers have some doubts after reading the post, and they post their doubts, queries and questions in the comment box to get some solution from the writer. If, we don't give response their queries on time they don't show any more interest in posts on your blog. Readers read your articles for exact solutions to their issues not for a half, then why they will come again if once they had not satisfied with your blog post. So, be active and reply to queries ASAP or you will loose your readers. Above give five tips are very real, genuine and important for blog owners, and I wrote that tips with my personal experience. There are lots of other factors also on which we should work to provide the best content to our readers, but above five tips are the utmost urgent. If readers are coming on our blog but not satisfied with the contents, then it will be the worst thing for us. We, blog owners are nothing without readers. Always try to give your best to your readers. 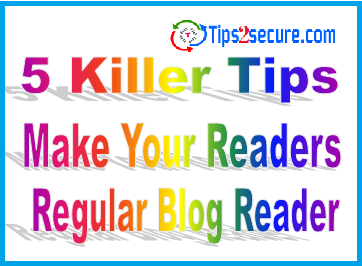 Message: I hope that you have enjoyed '5 Killer Tips to Make Your Blog Readers Regular' article. However, if you want me to deliver more items, then please share my post. You can use Social Sharing Widget provided at the end of every post. After all, Sharing is Caring! Thanks for this interesting and informative post. I Like this post. hmm, these tips to make your readers regular will work for all blogs. Yes Jewel, we are always here to serve our readers better by providing them more and more valuable information for blogging and SEO. So intersting. Helpful to me. Keep reading and stay updated with this blog to get more amazing updates and cools tech tips. Thanks, for your useful tips. Loyal readers of a blog plays a major role in success of a blog. I will implement your tips and will try to make more and more loyal readers.